World is not so simple as it looks. The first step of buying a house through Home Loan is to apply for Home Loan & for that you need to submit Home Loan Application with the bank. As i always mention that before filing Home Loan Application it is advisable to check CIBIL Score. 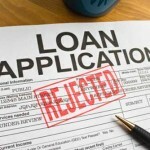 Low CIBIL score is most common reason for Home Loan Application rejection. Besides CIBIL Score there are some other critical considerations which play important role in Home Loan application. As a borrower i should be aware of all such points. I am listing down Five Shocks of Home Loan Application in this post. (a) Profession: Banks don’t lend to people in specific professions (I would not like to name the same). Normally these professions are risky with high degree of job uncertainty or job as such is risky in nature. One such broad category is self employed people. Its quite unfortunate that self-employed people find it most difficult to avail Home Loan in India. (b) Income: Thumb rule is that your monthly EMI outflow should not exceed 40% of total income. It can be relaxed upto 50% but if there is huge mismatch between Income level and EMI than the lender does not have any other option but to reject Home Loan Application. (c) Geographical Areas: Home Loan lenders don’t approve loans for specific Geographical Areas. Reasons can be many like Terrorist Threat, Environmental Issues, Areas Notified by Govt for projects, Disputed Land etc. (d) Age of Property: If property is more than 25 years old than in all probability loan will not be approved. Home Loan processing fees is charged along with Home Loan Application. Processing fees may vary from 0.1% – 0.5% of Home Loan amount or fixed in the range of 10k – 20k excluding service tax. If god forbids and Home Loan Application is rejected because of any reason, Bank will not refund Processing Fees. Common misconception is that this fees is refundable in case Home Loan Application is rejected or if the Borrower decides not to avail Home Loan at later stage after the loan is approved. It is better to discuss all such scenarios with Home Loan Provider & take it in writing before signing below the dotted line. In financial world, verbal commitments have no meaning. As i mentioned in my comments that it is always advisable to apply for pre-approved Home Loan rather applying for Home Loan after finalizing the property. The biggest disadvantage of applying for Home Loan after finalizing property is that you are not sure of Home Loan Eligibility. One of my reader, Mr. Darshan finalized a property and was planning to avail Home Loan along with his wife as co-borrower as she was also working. The Home Loan requirement was 80 lacs but combined eligibility i.e. Home Loan amount sanctioned was 60 lacs. It was a shocker and Mr. Darshan lost the token amount also as he was not able to manage deficit of 20 lacs. Its a wrong notion that if your salary is high than your sanctioned amount will be high. Banks consider multiple factors besides salary like current liabilities, current age, no of dependent members, any old age member in the family, other risks involved etc. As per RBI guidelines, Home Loan sanctioned for any project should not exceed 80% of total cost if Loan amount is more than 20 Lacs & 90% for Loan amounts less than 20 lacs. Another important criterion though it is not a major concern in big cities where property valuations are almost inline with sale value. In certain pockets of big cities & some upcoming cities, the sale values are much higher compared to Valuation of Property. Banks and Govt have Certified Valuers who are expert in property valuation. The loan amount also depends on Property valuation e.g. if you bought a property for 50 lacs and Bank Value the same at 30 lacs than bank will not sanction more than 24 Lacs as Home Loan amount even if you fulfill all other eligibility criterion. Banks provide list of documents required for Home Loan application approval and another set of documents required for property evaluation. If a borrower fail to provide any of these documents than Bank can reject the Home Loan Application. Bank may compromise on few non-essential documents or may suggest legal remedy if any such document is not available but 90% documents are must to process Home Loan Application. It is better to hire expert who can help in this process.